Kimberly Dale, 18, or North Canton. Daughter of Vern and Sally Dale. Attending GlenOak High School. Lisa Dale, 20, of North Canton. Daughter of Vern and Sally Dale. Graduate of GlenOak High School and attending University of Akron. Aundrea Green, 18, of Cuyahoga Falls. Daughter of Roxanne Green. Graduate of Tallmadge High School and currently attending University of Akron. Abigail Lyall, 18, of Canton. Daughter of James and Patricia Lyall. Attending Jackson High School. Victoria Nash, 18, of Massillon. Daughter of Valerie and Dave Nash. Graduate of St. Thomas Aquinas High School and plans to attend High Point University. Cassie Rossetti, 18, of Canton. Daughter of Kristen Rossetti. Attending Canton Central Catholic High School, and will attend University of Akron. Molly Selinsky, 18, of Massillon. Daughter of Brian and Jackie Selinsky. Attending Jackson High School. Kayleigh Kriss, mid-day personality and FM music director of WHBC Mix 94.1, and Ron Ponder, host of Points to Ponder on News-Talk 1480 WHBC, were masters of ceremonies, and Nicole Wohlheter was choreographer. 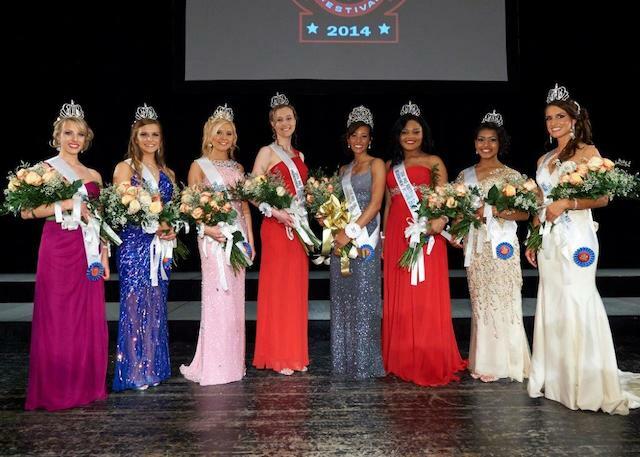 Vicky Sterling, 2014 general chairman of the Pro Football Hall of Fame Enshrinement Festival’s Canton Regional Chamber committees, assisted with crowning the new queen and seven Court members, and Bob Hill Quartet, Bella Gill, and Elec Simon provided entertainment throughout the Pageant. Judges for the event included Leslie Iams Kuntz, Director, Krugliak, Wilkins, Griffiths & Dougherty Co., LPA; George Lemon, 2014 Pro Football Hall of Fame Enshrinement Festival General Vice Chairman; Emily Menyes, Independent Hospital Network Coordinator, Aultman Health Foundation; and Kevin Smith, President and Owner, PPI Graphics & Innovative Trends. Crystal McLendon, 2014 Queen Pageant chairman, vice chairman Brenda Stevens, and the members of the Queen Committee will work with Enshrinement Festival staff to coordinate all activities relating to the Queen and Court during their service as goodwill ambassadors and positive role models throughout the summer via participation in a wide range of community service projects. Further, the Queen and Court will represent the community at all Enshrinement Festival activities, happening from Friday, July 18 through Monday, August 4.